Reloder 17–New Powder From Alliant? This falls in the “industry rumor” category, but we have it on good authority that Alliant Powder plans to introduce a new powder in the Reloader Series early next year, Reloder 17. That’s right, Seventeen. This powder should work well with many of the high-accuracy cartridges used in competition. As expected from its product title, the new propellant will be a mid-range, high-energy powder that is a bit slower than Varget or Reloder 15, but slightly faster than H4350 or Reloder 19. The new Reloder 17 could be ideal for the new mid-size match cartridges such as the 6-6.5×47, 6XC, 6.5×47, and 6.5 Creedmoor. (FYI, Hornady plans to load the 6.5 Creedmoor with H4350.) We expect the new powder to be a double-base formulation for high velocities. Reloader 15 is currently very, very similar to Norma 203B, produced by Dynamit Nobel in Europe. If Alliant is getting the new Reloder 17 from the same source, we predict RL17 may be similar to the new Norma URP (Universal Rifle Powder) released earlier this year in the USA. We have tested URP in a 6-6.5×47, and it is indeed slightly faster than Reloder 19, performing similarly to fast lots of H4350. Price at $19.00 per pound, Norma URP can be ordered through Powder Valley, (800) 227-4299. Illustration is an “artist’s concept”. Actual packaging may differ. Share the post "Reloder 17–New Powder From Alliant?" This Sunday, Veterans Day, we honor the veterans, living and dead, who have given so much to protect our country. Formerly known as Armistice Day, Veterans Day (November 11) is celibrated on the same day as Armistice Day or Remembrance Day in other parts of the world. (On the 11th hour of the 11th day of the 11th month of 1918, World War I formally came to an end with the German signing of the Armistice.) This is a day we honor all those who have served in the military, from 1776 to the present, many of whom made the ultimate sacrifice for freedom. 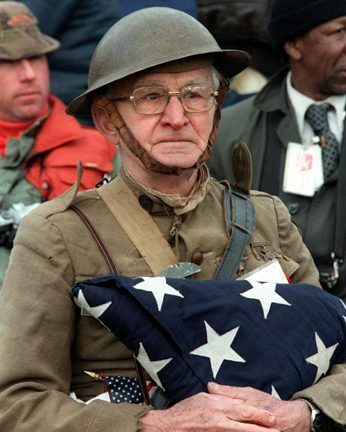 Joseph Ambrose, a World War I veteran, attends the dedication day parade for the Vietnam Veterans Memorial in 1982, holding the flag that covered the casket of his son, who had been killed in the Korean War. Ambrose, now deceased, was 86 years old in 1982 when this photo was taken. There are now just three surviving American WWI Veterans. Related STORY. 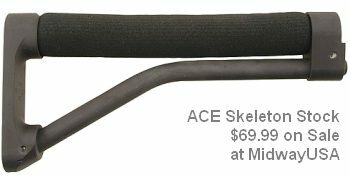 Share the post "Honor Our Veterans Today"
Share the post "ACE Skeleton Stock on Sale"